Andrew Sean Greer won the 2018 Pulitzer Prize for his novel, Less, but it wasn’t his debut novel. If you’ve already devoured Less, and I recommend you do that ASAP, then you’ll want to check out Greer’s other books! Andrew Sean Greer is the Pulitzer Prize-winning author of six works of fiction, including The Story of a Marriage, which The New York Times has called an “inspired, lyrical novel,” and The Confessions of Max Tivoli, which was named a best book of 2004 by the San Francisco Chronicle and the Chicago Tribune. He is the recipient of the Northern California Book Award, the California Book Award, the New York Public Library Young Lions Award, the O Henry Award for short fiction and fellowships from the National Endowment for the Arts and the New York Public Library. Greer lives in San Francisco. 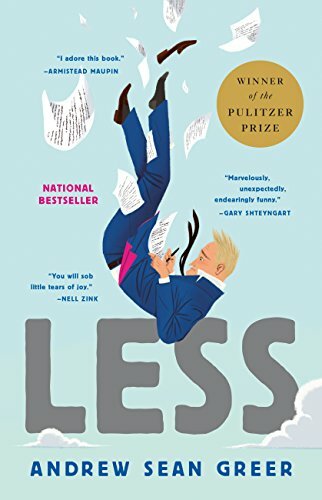 His Pulitzer Prize-winning novel, Less, comes out in paperback May 2018. Here’s his complete body of works! Who says you can’t run away from your problems? You are a failed novelist about to turn fifty. A wedding invitation arrives in the mail: your boyfriend of the past nine years is engaged to someone else. You can’t say yes–it would be too awkward–and you can’t say no–it would look like defeat. On your desk are a series of invitations to half-baked literary events around the world. QUESTION: How do you arrange to skip town?ANSWER: You accept them all. What would possibly go wrong? Arthur Less will almost fall in love in Paris, almost fall to his death in Berlin, barely escape to a Moroccan ski chalet from a Saharan sandstorm, accidentally book himself as the (only) writer-in-residence at a Christian Retreat Center in Southern India, and encounter, on a desert island in the Arabian Sea, the last person on Earth he wants to face. Somewhere in there: he will turn fifty. Through it all, there is his first love. And there is his last. Because, despite all these mishaps, missteps, misunderstandings and mistakes, Less is, above all, a love story. “We think we know the ones we love.” So Pearlie Cook begins her indirect, and devastating exploration of the mystery at the heart of every relationship–how we can ever truly know another person. 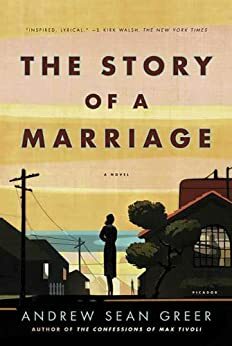 It is 1953 and Pearlie, a dutiful young housewife, finds herself living in the Sunset District in San Francisco, caring not only for her husband’s fragile health, but also for her son, who is afflicted with polio. Then, one Saturday morning, a stranger appears on her doorstep, and everything changes. After the death of her beloved twin brother and the abandonment of her long-time lover, Greta Wells undergoes electroshock therapy. Over the course of the treatment, Greta finds herself repeatedly sent to 1918, 1941, and back to the present. Whisked from the gas-lit streets and horse-drawn carriages of the West Village to a martini-fueled lunch at the Oak Room, in these other worlds, Greta finds her brother alive and well—though fearfully masking his true personality. And her former lover is now her devoted husband…but will he be unfaithful to her in this life as well? 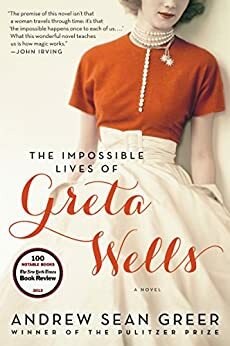 Greta Wells is fascinated by her alter egos: in 1941, she is a devoted mother; in 1918, she is a bohemian adulteress. 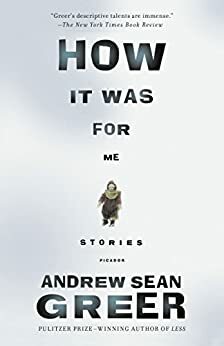 In this spellbinding novel by Andrew Sean Greer, each reality has its own losses, its own rewards; each extracts a different price. Which life will she choose as she wrestles with the unpredictability of love and the consequences of even her most carefully considered choices? In the title story of this collection, neighborhood boys crouch in a backyard toolshed, and conspire to prove their piano teachers to be witches. In “Cannibal Kings,” a disillusioned young man accompanies a troubled boy on a tour of prep schools through the Pacific Northwest, only to realize that he has lost his way in life. And in “Come Live With Me And Be My Love,” a middle-aged gentleman looks back at his mannered early life as a Ivy Leaguer, married to a vivacious woman but silently yearning for his best friend — and the sacrifices that each made to uphold their compromising bargain. We are each the love of someone’s life. So begins The Confessions of Max Tivoli, a heartbreaking love story with a narrator like no other. At his birth, Max’s father declares him a “nisse,” a creature of Danish myth, as his baby son has the external physical appearance of an old, dying creature. Max grows older like any child, but his physical age appears to go backward–on the outside a very old man, but inside still a fearful child. The story is told in three acts. First, young Max falls in love with a neighborhood girl, Alice, who ages as normally as any of us. Max, of course, does not; as a young man, he has an older man’s body. But his curse is also his blessing: as he gets older, his body grows younger, so each successive time he finds his Alice, she does not recognize him. She takes him for a stranger, and Max is given another chance at love. 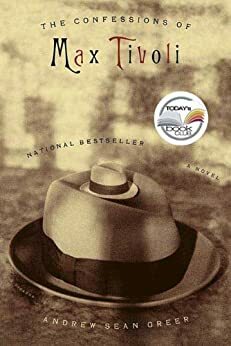 Set against the historical backdrop of San Francisco at the turn of the twentieth century, Max’s life and confessions question the very nature of time, of appearance and reality, and of love itself. A beautiful and daring feat of the imagination, Andrew Sean Greer’s The Confessions of Max Tivoli reveals the world through the eyes of a “monster,” a being who confounds the very certainties by which we live and in doing so embodies in extremis what it means to be human. In 1965, on a small island in the South Pacific, a group of astronomers gather to witness the passing of a comet, but when a young boy dies during a meteor shower, the lives of the scientists and their loved ones change in subtle yet profound ways. Denise struggles for respect in her professional life, married Eli becomes increasingly attracted to Denise and her quixotic mind, and young Lydia attempts to escape the scientists’ long-casting shadows. 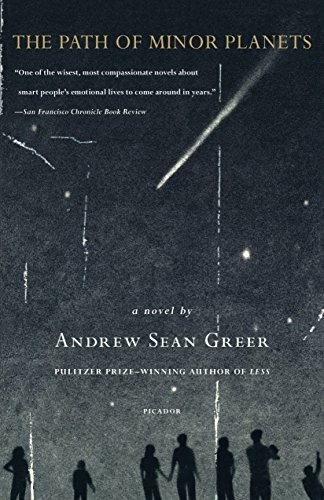 Andrew Sean Greer’s remarkable and sweeping first novel, The Path of Minor Planets, is an exploration of chances taken and lost, of love found and broken, and of time’s subtle gravitational pull on the lives of everyday and extraordinary people.